June 23, 2016 Click on the photo to the left to hear Jack performing the song "Simple Man" by Lynyrd Skynyrd with the Ghost Riders Band at the 65th NSDC. Scott Bennett released the square dance version on Crest Recordings. 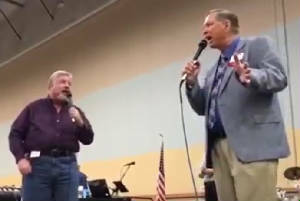 June 24, 2016 Click on the photo to the left to hear Jack and Scott Bennett performing the song "WKRP in Cincinnati" at the 65th National Square Dance Convention. Scott put this song together on Acme Recordings to help promote the 66th NSDC being held in Cincinnati, OH June 22 - 24, 2017. 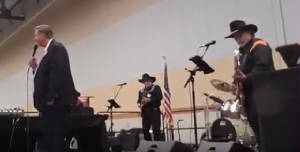 June 25, 2016 Click on the photo to the left to hear Jack performing the song "Sharped Dressed Man" by ZZ Top with the Ghost Riders Band at the 65th National Square Dance Convention. Love that Southern Rock. 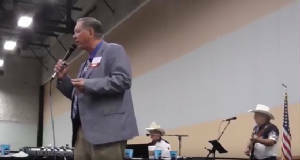 June 25, 2016 Click on the photo to the left to hear Jack performing the song "It Feels Good" by Drake White at the 65th National Square Dance Convention. It was recorded for square dancing by Jet Roberts on Chic Recordings. Chic is a great new label with the female caller vocal ranges in mind produced by Shauna Kaaria. Click this photo to see the 64th National Square Dance Convention Competition Squares called by Tony Oxendine and myself. 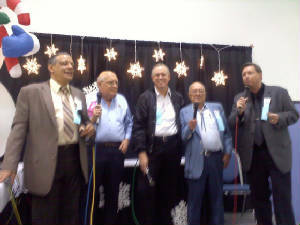 (From left to right) Tony Oxendine, John Saunders, Jerry Story, Marshall Flippo, and Jack perform at the GSI Winter Festival in Lakeland, FL January 28, 2012. Nearly 1,000 dancers attended the event. 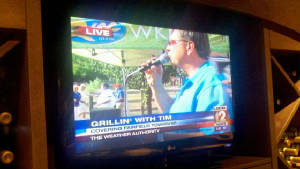 The WKRC Cincinnati Channel 12 News "Grillin with Tim" was held at our home July 12. Meijer, Q-102 Radio, SpringDot Water, Lowthers Catering, and WKRC came out, set up tables, grills, booths, and tents and grilled for 200 of our square dance friends and neighbors. WKRC Chief Meteorologist Tim Hedrick broadcasted the days weather reports from our backyard. 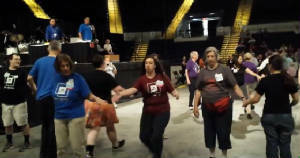 We were able to plug square dancing and our upcoming new dancer class over the air to the entire So Ohio tri-state area. And even danced a song. Click on the photo on the left to see a YouTube video of some of the event off the air. View the actual broadcasts at the below links. 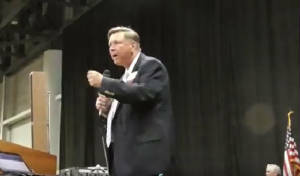 CLICK THE PHOTO ON THE RIGHT TO SEE A YOU TUBE VIDEO OF JACK CALLING PATTER AT THE 2012 CLEVELAND FEDERAMA. Here's a few You Tube links with Jack calling some singing calls at the 2012 Merry Mixers "Touch of Class" special in Newport News, VA.